Ivory « What Happened to the Portcullis? Officials travelling to Tanzania with Chinese President Xi Jinping went on a buying spree for illegal ivory, an environmental activist group has said. In a report, the Environmental Investigation Agency cited ivory merchants who said demand from the delegation in 2013 had sent prices soaring. China denies the allegations, saying it consistently opposes poaching. Read the following blog – Tanzania – Chinese ivory spree during presidential visit. authored by Africa – News and Analysis. 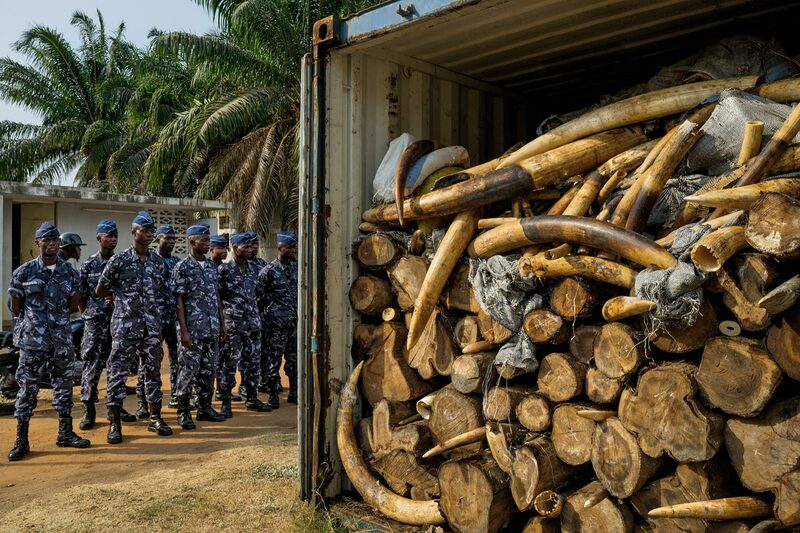 With record levels of global ivory seizures in 2013, mostly in ports, a new Interpol report highlights the need for greater information sharing to enable a more proactive and effective law enforcement response against trafficking syndicates. Large-scale ivory shipments – each one representing the slaughter of hundreds of elephants – point to the involvement of organized crime networks operating across multiple countries. Head of Interpol’s Environmental Security unit, David Higgins, said while there was a global recognition of the problems of elephant poaching and ivory smuggling, a more integrated approach was needed for a more effective response. “Ivory seizures are clearly an important step in stopping this illicit trade, but this is just one part of a much bigger picture,” said Higgins. “If we are to target those individuals behind the killing of thousands of elephants every year, who are making millions at the cost of our wildlife with comparatively little risk, then we must address each and every stage of this criminal activity in a cohesive manner. The report ‘Elephant Poaching and Ivory Trafficking in East Africa – Assessment for an effective law enforcement response’ was launched at the Canadian High Commissioner’s Residence in Nairobi, Kenya. While poaching in Kenya has reduced due to more pressure by security agents on poachers, the country is being used as a transit route with the port of Mombasa becoming a favorite for poachers. The ivory is packaged in shipping containers for transport to the port, and interception of the majority of ivory has occurred in maritime ports with the loot hidden in shipment containers usually concealed by other lawful goods. Uganda though a landlocked country is becoming a transit route for the ivory, mostly from Tanzania. Tanzania was the leading source of illegal ivory in the East African region last year. At the same time, the port of Mombasa accounted for the largest volume of seizures in Africa with a total of over 10 tonnes of illegal ivory intercepted between January and October 2013. Approximately 30 elephants are killed in Tanzania daily amounting to more than 10,000 animals annually. An estimated 22,000 elephants were killed illegally continent wide in 2012. Tanzania’s elephant population has continued to plummet in recent years and in Selous Game reserve which boasted the world second largest elephant population at 70,000 elephants in 2006, the numbers have fallen to an estimated 39,000 elephants in 2009 and currently stand at 13,084 elephants. There is global concern about the problem. The Illegal Wildlife Trade Conference, held in London this month, agreed key actions to stamp out the illegal wildlife trade. During the conference, chaired by Foreign Secretary William Hague and attended by the Prince of Wales, the Duke of Cambridge and Prince Harry, world leaders from over forty nations vowed to help save iconic species from the brink of extinction. The London Declaration contains commitments for practical steps to end the illegal trade in rhino horn, tiger parts and elephant tusks that fuels criminal activity worth over $19 billion each year. Authorities in Hong Kong have intercepted one of the largest shipments of illegal ivory in history – 1,209 elephant tusks and ivory ornaments weighing more than 8,400 pounds. The Hong Kong Customs and Excise Department announced the seizure on Saturday of 3,813 kilograms of ivory hidden inside two containers shipped from Tanzania and Kenya. One container was labeled as carrying plastic scrap, the other was marked as dried beans. 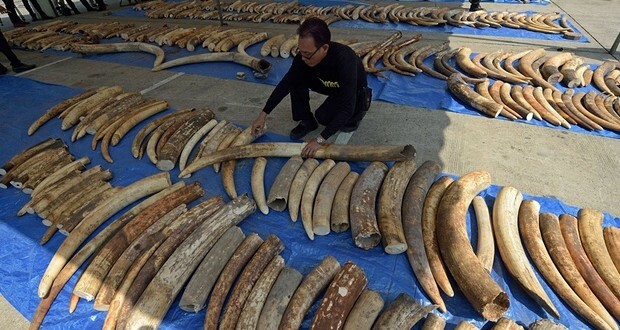 It was the largest-ever seizure of contraband ivory in Hong Kong. Even within the context of soaring wildlife poaching, the numbers are staggering: the equivalent of more than 600 dead elephants. So lucrative is the ivory trade now that well-armed mafias have gotten in on the act. Hong Kong officials estimated the value of the seizure at 26.7 million Hong Kong dollars, or just under $3.5 million. 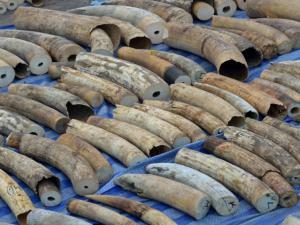 The customs agency, which said in a statement that it had “smashed” the ivory smuggling case, reported no arrests. But the South China Morning Post reported that seven people in China were arrested in connection with the seizure. Demand from an increasingly affluent Asia, improved international transport and trade links, and weak enforcement and feeble penalties (in many countries) have caused wildlife poaching to jump over the past decade or two. More than 300 elephants were killed in Cameroon alone early this year. A video from the World Wildlife Fund shows some of that grim slaughter. In this article, published in September, Jeffrey Gettleman reported that ivory — like blood diamonds from Sierra Leone or plundered minerals from Congo — is now a “conflict resource,” used to help finance conflicts across the African continent.